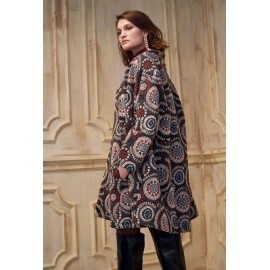 Luna di Giorno zip jacket.​Composition: 77% modacrylic, 23% polyester.Color: Chocolate. 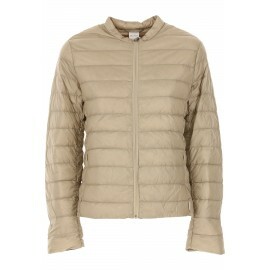 Luna di Giorno zip jacket.​Composition: 66% cotton, 34% polyester.Color: Cream. Twin-Set jacket.Wool blended bomber effect with gold metal buttons, ribbing. Pockets on the front.53% acrylic, 16% wool, 15% cotton, 14% polyester, 2% other fibers. Lining: 100% viscose. Material 2: 40% wool, 10% cashmere, 20% polyamide, 30% viscose.Color: White. Twin-Set jacket.Wool blended bomber effect with gold metal buttons, ribbing. Pockets on the front.53% acrylic, 16% wool, 15% cotton, 14% polyester, 2% other fibers. Lining: 100% viscose. Material 2: 40% wool, 10% cashmere, 20% polyamide, 30% viscose.Color: Black. Twin-Set coat.Loop-effect wool-blend coat with cross closure and invisible snaps. Pockets on the front.Composition: 53% acrylic, 16% wool, 15% cotton, 14% polyester, 2% other fibers. Lining: 100% viscose. Material 2: 40% wool, 10% cashmere, 20% polyamide, 30% viscoseColor: Black. 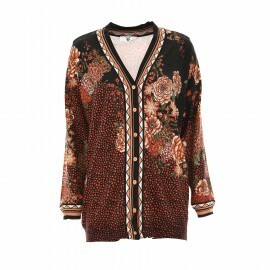 Twin-Set viscose-blend cardigan with floral print, round neck and long sleeves.Composition: Fabrics: 55% viscose, 45% polyamide. Mesh details: 90% viscose, 10% polyamide.Pink color. 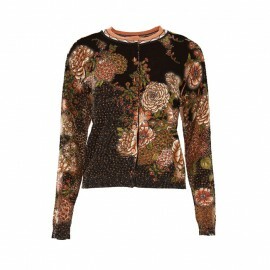 Twin-Set viscose-blend cardigan with floral print, round neck and long sleeves.Composition: Fabrics: 55% viscose, 45% polyamide. Mesh details: 90% viscose, 10% polyamide.Black color. Jacket in double jersey scuba, with collar type jacket and pockets zipped. Flared cut and low slit on the sides. Unlined Double slider zipper.Composition: 98% viscose, 2% elastane. Flat leather mules with mink fur band. Suede lining and leather sole. Mink upper, calfskin; Calf lining; Leather sole. Alpaca blend stretch cardigan in stocking-stitch knit; seamless. Asymmetric front panels are draped at the sides and can be wrapped around the neck like a scarf. Fastening with matching belt.52% alpaca, 28% nylon, 17% wool, 3% elastane. 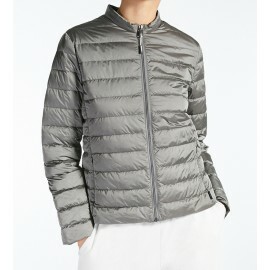 Padded and quilted short padded jacket in shimmering, water-repellent nylon fabric with side pockets and zipper on the front. The matching case that comes with the item makes it easy to store. 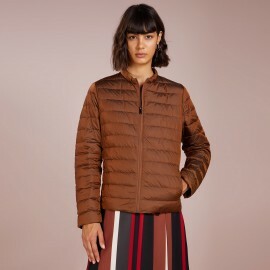 Fabric: 100% polyamide; Lining: 100% polyamide; With natural goose down padding; With ououi for the garment: 100% polyamide.